The Blood of Olympus is once again told from alternating POV's, this time being Leo, Piper, Jason, Nico and Reyna. The addition of Nico and Reyna almost made up for the complete lack of Percy and Annabeth. But not quite. It was a real joy to get to know both Nico and Reyna, with Nico being an early favorite and Reyna fast becoming a new favorite. Obviously I love both of them even more now! I was also happy that we finally got to know Jason better. After being introduced to him sans his memories in The Lost Hero, the poor guy has largely been given the shaft. It always seemed like a waste to me so his growth and character arc here was quite satisfying. Leo, another early favorite was a big plus too, and I have to say that it's a really good thing that we got that last chapter there at the end...otherwise, I would not have been a happy camper. I was less enthused with Piper's POV though. I never minded her really, but I never loved her either and I'm not sure why Riordan decided to make her into such a priority...but anyways. The thing is: true heroes like Percy and Annabeth ended up taking a back seat to the likes of Piper, which seemed not only unfair but a disservice to the lead characters - not to mention all of their fans. It felt like getting a sequel Harry Potter series, only to have Harry take a back seat to a bunch of younger noobs. Uhm yeah, how about NOPE! Not cool. Never gonna happen. When you establish your main hero, you can't just then have him sit it out while others take over. Needless to say, after how heroic Percy and Annabeth were in The House of Hades, it was a huge letdown to have their presence whittled down to virtually nothing here. Percy had temper tantrums, took idiotic risks and largely sat out the important quests while all the new characters stepped up. Annabeth was rendered completely hopeless while Piper saves the day single-handedly. Whaaa?! Yeah, I wasn't a fan of how my favorite characters were handled at.all. It was more than them not having their own POV; it was the fact that they didn't actively take part of the action like they should have. Plot-wise, everything moved steadily, up to the climax. That whole section left me unimpressed. The action lacked a certain momentum at that point and when the big battle came around, it seemed like it was over before it even began. It was very anti-climactic. In the original Percy Jackson Series, I thought the strongest installment was book 4 and the same holds true here. 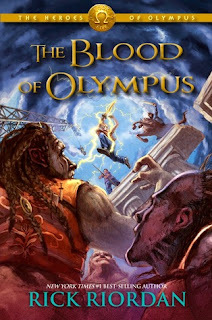 If anything, The Last Olympian is a stronger series ender than The Blood of Olympus ended up being. The Last Olympian was an adrenaline rush, start to finish. 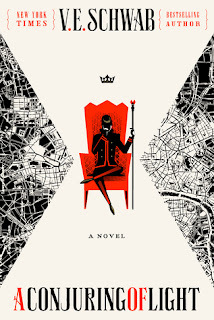 Here, the story lost a lot of steam at the end, especially considering how intense the previous installment, The House of Hades ended up being. 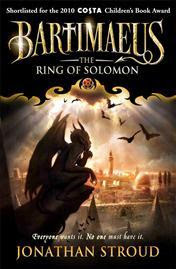 My issues with the conclusion aside, I had a lot of fun marathoning The Heroes of Olympus books. I can't remember the last time I read a series straight through like that and it's something I have to start doing more of again. I've grown to love all of these demigods and I already miss adventuring with them! I'm still needing to read House of Hades. Your review has me a little bummed out though to be honest. Percy and Annabeth in the backseat?? Temper tantrums? He supposed to be one of the most mature ones in the story now. I agree that The Last Olympian was a strong series ender so it's really sad to hear about our favorites missing out on so much. I'm with you on Piper. She's ok, but she's not Annabeth. Ah well, I'll still be reading it but I'm not as excited about it as I was. Great review! I can't imagine Harry and co. ever taking a backseat to new characters, so having that happen to Percy and Annabeth is a real bummer! Ughhh, it's so disappointing when a series finale doesn't quite deliver like you hoped. :/ But- congrats on binge reading the series all the way through! I reeeeally liked this one but I AGREE WITH A LOT OF THIS. I didn't love Piper and Jason (or really Hazel that much?) and gah, I think this is probably because we have more history with Percy/Annabeth so we want more of them? Maybe? ANYWAY. I really wish they'd featured more too. LEO IS MY DARLING BABY AND MY HEART BASICALLY EXPLODED TOWARDS THE END. I liked it too just not nearly as much as House of Hades ♥ I don't know what it is about me and Riordan but his 4th books in a series are always my favorite LOL! I like Jason and Hazel well enough but definitely not as much as my beloved Percy, Annabeth and LEO! If that last chapter wasn't added on there, I would have been PISSED. I completely agree with you! I was super bummed when Percy took a back seat here. I still enjoyed this one and thought it was a good conclusion but I felt cheated by the lack of Percy. Great review! 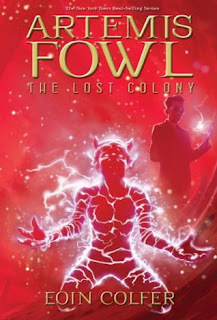 A shame that this final book was a bit of a let down for you, considering his stories are pretty action packed from start to finish. Nice review! Whelp, I know it was a pretty big disappointment not having Percy and Annabeth's POV wasn't it? I do quite like the new kids, but I concur that it was a major misstep on Riordan's part not to have a Percy POV in this - surely he should have known that fans would be let down by that!! It really was Aylee, but it wasn't just the missing POVs that got me: their story arcs were basically non-existent. I could have handled the lack of their POVs if they actually had storylines here...but...they didn't. I get giving the other heroes their time to shine but not at the expense of established (and imo better) characters!